10 years ago, buying things online were quite unheard off. We all wanted to have the touch and feel of brick and motar shops. Where we can intereact with the sales person and even try out the product before speding our hard earned money. 5 years ago we were all still quite skeptical about buying stuff online but its starting to catch on. With auction sites booming and gaining momentum, it was the in thing. Now adays it has become quite a norm to be buying things online. With payment facilities avaiable from local banks, and of course credit cards. All of us are able to buy things with a click of a mouse. When I started playing around with my dSLR camera about two years ago, I went to shashinki.com to make a few purchases. As our local photography stores do not have much choices and every time I want any thing it would have to wait to be ordered. And after that I bought a few more items from there. Last year if I’m not mistaken yamiya.com.my came online. Prices were quite competitive with shashinki.com but I have never bought anything from them. That may change within a few months time from now. This year, ylcamera.com.my came online. For those who do not know, YL Camera is actually a brick and motar store located in Pudu Plaza in Kuala Lumpur. 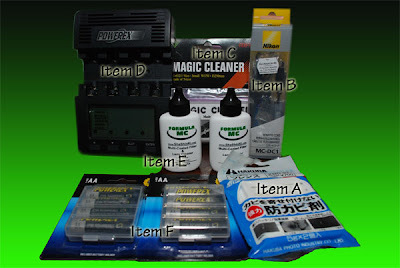 Its famous for the amount of used products that they have and their competitive pricing. I was quite surprise that an actual store has went and opened up an online store. Other companies have their own website, but never had the facilities to purchase from the website itself. Both shashinki.com and yamiya.com.my do not have a physical outlet therefore it keeps the costs lower and competitive. I wonder why did they decide to have a go at online store? Has it come to a stage where online stores were cutting into the profits or sales in the actual store? I know for a fact that locally here, people would walk into the local shops and compare price with the online retailers. In the end, forcing a few shops to sell at lower price or relatively similar. Well its a good thing, in a way, we have more choices. The bad thing is, my bank account will always be out of money. hehe, what expensive hobby we have. I have added these 3 stores into my links in the left column. Will update more if there are any more local online stores that shows up from now onwards. If you know of any which I have not listed here, do tell me about it, Thanks! Just came back from an outing with the photobugs. We went to Jankar Waterfall. We took met at a popular kolomee stall in Kuching at 6am. I was so blur this morning, slept quite late woke up at 3am scared I couldn't wake up for the trip. But I manage to wake up and reach the meeting point at 6.10am. There was a total of 8 people (including me) on the trip, and once gathered, we headed off at around 7am. We took a 1 hour plus drive to some kampung road which was rocks and dirt. :-( my car now is not black no more, its covered with white dirt!!! The kampung road took us another 30 mins drive, and then we reach the kampung exit. to find ourselves cutting thru peoples farms to find the water fall trail. The trail was ridiculous its basically non existent! We walked up steep inclines, crawl on foliage, for about 30 mins. Then we started making our way on the water trail. Gosh even worse! Cos my sandals had no grip and my gear was throwing off my balance. This combination added weight and strain on my legs. Some stones I cant climb cos I had too much gear weight and no traction. Once I pass some of my gear to my friends I could make up up easy. About 25 mins of water trail, we finally reach the waterfall. What a spectacular place. fantastic. After a long and slow trek, we finally completed the water trail. Thats when my cramps start, at first it was only my calf muscles. Then both legs had slight craps. After 10 mins or so, the thigh muscles had cramps. Then both legs. I had to stop and sit down for 4 times. Each time the pain and the cramps got worse and worse. lower leg and mid legs all cramp. Didnt know to bend it or to keep it straight cos ALL muscles had cramp on both legs. I put heat rub also no use. Each time I stop I was out of breath, breathing hard because of the pain, not because I was tired or exhausted. I had never had both legs all muscles cramp on me before. I always had leg cramps problem when I was a kid. I guess something is wrong with my legs, weak. And under the circumstances today, where I had no grip and extra weight everything came all together. So finally we all made it out, the 6 ahead waited for me and Alex (who stayed to help me) for 45 mins. Then we went to Lundu to have lunch. I couldnt drive at all, so Alex drove my car. After lunch I was feeling better and I drove back down to Kuching. We were all having a lot of fun chit chatting the day's trip and before you know it, I didnt take a turning to Kuching and was heading 60 km away from the junction. Only realise when I saw Semantan (1km) I was like HUH? SEMATAN? OMG WRONG ROAD! There are many resorts with nice beaches in Sematan. Well we were all laughing our heads off, wondering why didnt we notice the junction. When I was about to make a u-turn we noticed that the waves were extremely rough. So we parked and went down to the jetty. Wow! The waves were breaking at the retainer wall with such force that it shook the ground. So we all got off from my car, and grabbed our camera gear. And started taking photos. After thats done, we took another 1hour to get back down to Kuching. Had a short detour to a friends shop. He ordered a Nikon D300 which arrived in the afternoon. So we went over to had a look and have a go at it. A VERY POISONOUS CAMERA! I WANT! flew to Kuala Lumpur yesterday at around 11am. Headed to Equatorial Resort in Bangi. As my colleague Steven got married and had his wedding reception there. The room was quite decent! He provided me the room. Mr Yip and I shared the room. Today after checking out, me and Mr Yip went to eat the famous Fish Head noodles in duno where lar.. Im bad with directions... bah! Then he dropped me off at Amcorp Mall... I have been meaning to go to Amcorp mall but never found the time. SO this was not a planned visit. I walked in, and I found J One. A famous for decently price photo gear company. And I made a unscheduled purchase of a manfroto tripod costing RM 630.00. Then I went off to Shah Alam. To watch the GRA Round 4. It was fantastic! I wish we had something similar in Kuching. It rained quite hard. I got wet, my sports shoes got wet, my socks were wet. I was there from 1pm till 7pm. lugging around my camera bag which was about 3.5kg and the spanking brand new tripod about 3kg. -_- now my left shoulder is so sore. especially my left collar bone. Ouch! But it was worth it. I got to practice more on my panning shots. I understand more now. Thing is still not used to the VR lens which I borrowed from Stephen. The stabilizer system is wonderful on still objects, but once the lens move, it has a really strange sensation. As the gyro is fighting your hand motion. So since the air tickets were already paid for, lets look at how much I spent on TAXI rides this round. So all in all my taxi travels around KL is RM 143.00. The most expensive was the ride from Taman Mayang. Not only did the driver take the wrong road, he was not experienced driver, very twitchy and almost made me late for check in. When I reached the air port, I had only 4 mins to check in. Didnt even allow me time to grab something to eat! Time to sleep! Have to work tomorrow! Okay, my goodies from shashinki arrived yesterday. Of all of these items, I found item D, the MH-C9000 to be the coolest. Because of the white back light. 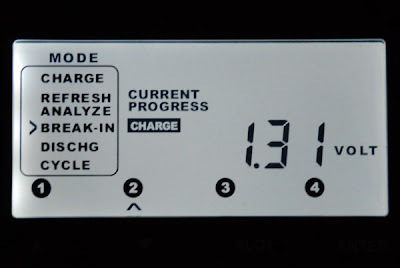 Since I had new batteries, I used the BREAK IN mode on the MH-C9000. So far its well over 24 hours and the batteries are still charging. 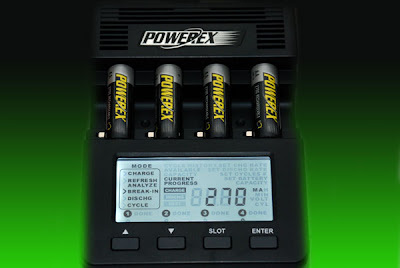 Accodring to the manual, it will charge and discharge a few times before the battery is ready. Can't wait to test them out! woot ! COOL! Im gadget crazy! Even dreaming also dream about it! ah... it was a great weekend. Didn't really do much of anything. Didn't take photos. Only few snapshots of the raya visitation. Then drove alot, ate alot, drank alot. Awesomes! I manage to process 3 albums and uploaded them to multiply. Whews! At least less back log now. Still more to go but it was a good feeling to clear them. I still have not processed the Penang photos. Don't feel like it tho. cos much of them is corrupted. :-( sigh. now back at work. in office, dont feel like working. feels like going back home and sleep. what a great weekend. switched off all alarms. woke up at 1030am. ahh... feels like old time. go out when ever I want, play computer all day... those were the good ol'days. Im quite broke, I paid off my flash unit. RM 1,350. Just to avoid the late payment and interest. Now I have to last till 28th (payday). sigh. I'll be going to kuala lumpur on the 26th till 28th. Cecilia and Thomas are getting married. They have asked me to help them take some photos of the ceremonies. Hmm... I have to pay for my own tickets, accommodations, transportations, and because of the wedding I bought the flash unit. And dont forget the red packet! Just for a wedding, so far I have spent RM 360 on airtickets, RM 1350 flash, RM 99 battery. RM 1,809 so far. As the days draw closer, the more I will spend .z.z.z.z.z.z.... lucky for me I'm working.